Living in Canada, we get to experience all that winter has to offer. 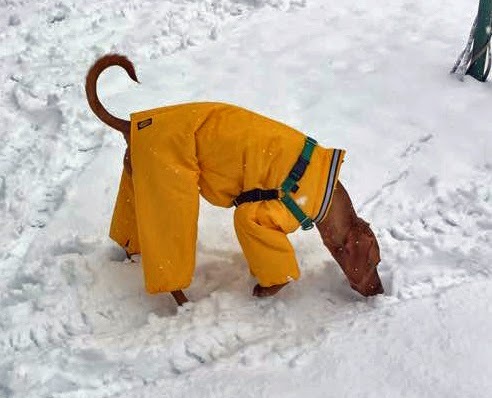 While the snow can provide from some great fun, we do have to make sure our pets are protected during extreme weather. We’ve already had some great windstorms that downed trees and fences. The following tips will prepare you and your pets as winter approaches and the cold sets in. Salt and cold can damage your pet’s paws, causing pain and discomfort. There are a couple of options to protect their paws so you can continue to enjoy winter walks. While some dogs have a built-in winter coat, others may benefit from a fabric coat to keep them warm. In extreme temperatures, you may need to adjust your walks to ensure your pet doesn’t suffer from cold-related illnesses. Bodhi is a Hungarian Vizsla with thin skin and short fur. Her snowsuit keeps her cozy in the cold. With the days becoming shorter, make sure drivers can see you and your pet by wearing reflective clothing and lights. Cross streets and even driveways with caution, making sure the drivers see you. For people, flashing bicycle lights or headlamps provide that extra bit of visibility. Headlamps also double as a locating device for your pet’s stool. For your dog, lit collars and leashes are a fantastic addition to their wardrobe. Ice is fun for winter sports, but it can also be dangerous while walking with our pets. A simple slip can result in a serious injury for both parties. Having a dog that is trained to walk in heel is a huge step towards winter safety. Shoe spikes are also a great investment for your own safety. These simple to use accessories wrap around your boot and provide great traction while you walk. For your dog, a slip on the ice can cause an injury, but they can also cut their paws on jagged pieces of ice. Boots can help to provide traction and prevent cuts. When the ice is bad, I would recommend staying indoors and mentally stimulating your dog to tire them out. Even if your dog has a naturally thick winter coat that makes you jealous, they are not suited for prolonged exposure to extreme weather. Even double-coated breeds have sensitive paws, ears, and noses that can be frostbitten in the cold. Monitor your dog outside to ensure they are safe and happy. Amelia loves the winter and she’s able to enjoy the snow while her mommy keeps an eye on her. In this photo, she was eating a turkey neck when a mini snowstorm came around. I imagine this is right up there on Amelia’s favourite day’s list. Never allow your dog off-leash in the front yard during snowstorms, even if they have reliable recall. Dogs have difficulty with understanding their boundaries when the ground is covered with snow. They become disoriented with strange scents and impaired vision and can easily wander into harm’s way. Remember that drivers can’t see over the snow banks and their braking ability is compromised on slippery roads. If you do allow your dog off-leash, make sure you are in a dedicated leash free area. There are many areas with secure fencing to allow your dog to run freely. Our dogs rely on us to keep them safe all year round. Follow these tips to ensure you and your dog gets the most out of the winter season. If you have a favourite winter activity, share it with us so we can let others know.